PLOT: Michel takes up pickpocketing on a whim and is arrested soon after. Despite the objections of his only friend, Jacques and his deceased mother’s neighbour Jeanne, Michel teams up with a couple of petty thieves in order to improve his craft. Robert Bresson’s is one of the greats of French cinema, often regarded as the second best French film-maker after Renoir. He made films for 50 years and this highly acclaimed tale of a petty thief was almost smack bang in the middle of his career. Bresson’s style is very artistic and visual, and relied heavily on the actor to deliver a non-performance. To do this he would retake shots over and over again until all semblance of performance were gone and all that was left was natural and raw. 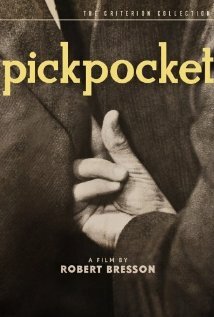 This is evident in Pickpocket as Martin LaSalle a young amateur actor for Uruguay delivers a subtle and almost lazy performance as Michel, a man who gets himself entwined in the work of petty theft despite having no need to steal. Following his mother’s death, Michel sets out to steal money from a spectator handbag at the racetrack. Wether this is for the excitement or to hide the grief is unclear, but Michel plans and practices the deed. However he is very quickly caught and taken to the police station. When it transpires that they have no proof of his guilt he is set free, with the stolen money. Very soon he is looking for the thrill again and then teams up with a mysterious stranger who hones his art. The dialogue is sparse and music is only ever used in-between scenes, but this is very effective in keeping the mood and enables you to get inside Michel’s mind rather than just hearing his words. The story meanders through Michel’s dark career (including two years spent pickpocketing in London) and trying to go straight and look after friend Jeanne and her new child. But Pickpocket is a love story at heart and as Michel finally realises his love for Jeanne, he has already given up his freedom. From his jail cell he finally lets slip the morale of the tale. Life is a journey that you must embark on. Even from the darkest moments in life can bright new paths open up. A fine example of French New Wave film-making that is a beautifully shot tale of life’s twists, turns and returns.